A Life of Her Own is a classic drama starring Lana Turner as small-town Kansas girl, Lily James who seeks fulfillment through a modelling career only to find that success–without love–is a hollow triumph. It takes Lily 6 months to save for the fare from Kansas to New York, and this is evidence of her determination to succeed at the career she longs for. She arrives in the chaotic offices of the Thomas Caraway agency and manages to attract the attention of the owner (Tom Ewell). While he agrees to take Lily on as a model, he has reservations about her potential. After many years in the business, he considers himself a good judge of character, and a kind streak appears in his treatment of has-been, boozed up model, Mary (Ann Dvorak). It’s fate that Lily meets Mary in Callaway’s office. Lily is right on the verge of beginning her career and aging Mary, after 13 years on the modeling circuit, is washed up. Mary takes Lily under her wing, and Lily’s first, significant night in New York is spent with Mary, her date advertising executive Lee (Barry Sullivan), and Lily’s date, lawyer Jim (Louis Calhern). Lily is a new fresh face in town, and Lee makes it clear that he’d rather be with Lily than with Mary. It’s a horrible evening with bitterly jealous Mary getting drunker by the minute. As it turns out, it’s a night that Lily never forgets, and Lee plays a small yet significant Faustian role in Lily’s life when he reappears much later. Lily takes a harsh lesson from Mary and so begins her climb to success. Her famous, perfect face is on the cover of every magazine, but in spite of the fact she is a 50s ‘super model,’ her personal life is negligible, and her feet remain firmly on the ground. Lily continues to live at that bastion of female propriety, The Betsy Ross Hotel–a hotel which restricts male visitors to the mezzanine with a forced 10 pm departure. Always lurking in the shadows is the memory of Mary and how easy it can be to slide from fame and fortune into obscurity. Lily’s world is shaken to the core when she’s introduced to Steve Harleigh (Ray Milland), a wealthy copper mine owner. They fall in love, but Steve is a married man…. 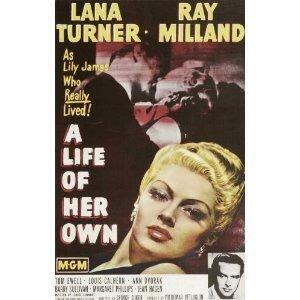 A Life of Her Own is essentially a soap drama, and beautiful Lana Turner is the best element in the film. It’s easy to imagine her single-minded devotion to her career, and it’s also equally easy to understand how she’ s side-swiped by love. Ray Milland doesn’t quite cut it as the lover–he seems tired or perhaps defeated as the man torn between love and duty. This is the classic cornelian dilemma (choix cornélian*) in which a character must choose between two courses of action with either choice resulting in a negative result on someone involved. As with any soap, some of the elements are corny or hyped up to add to the drama. In this film, Steve’s wife, Nora (Margaret Phillips) is angling for sainthood, and of course this just makes the affair between Lily and Steve that much more atrocious. Lily initially shows a great deal of fire and backbone when she deals with the slimy Lee, but unfortunately the script reins in Lily and instead doles out passivity and victimhood. I rather liked A Life of Her Own in spite of its flaws. I liked the film’s structure, its emphasis on character, and the way the plot followed Lily through her rise to fame while showing the hollow triumph of her success. Lana Turner does a terrific job with the role she’s handed, and I particularly enjoyed the scenes with Lee. We can practically see Lana’s skin crawl with disdain for this low-life, opportunistic character. * Special thanks to www.bookaroundthecorner.wordpress.com for explaining the choix cornélian–a term derived from the plays of Pierre Corneille. The title reminds me of “A Room of One’s Own” by Virginia Woolf. Given the theme of the film, I don’t think it’s a coincidence. Actually, I didn’t think of that, but I did think the title was a bit odd as it doesn’t really fit the film. I love Lana Turner. Do you happen to like Douglas Sirk’s movie? I’m just starting to watch some of the more famous ones. Some like Written on the Wind I’ve seen before. This sounded a bit similar. Yes I am a huge fan of Sirk. My all-time favourite director is Fassbinder and he was influenced by Sirk. I’ve reviewed a few here. Not everything by any means.